> Uncategorized @en > Official photo moment: what must I do with my hands? Official photo moment: what must I do with my hands? Greetings to all followers of our blog. Every day you are more and that makes us happy. As you know we do not like to do long and tedious post. Here we come back with one about protocol that we will try to make simple and with direct keys. No one knows how or where to lay hands during ‘pict moments’. Well, in this image, no one does what is right. 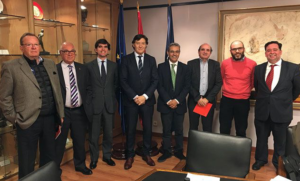 Here it is an act in which the president of the Higher Council of Sports, José Ramón Lete, recognized the work of the nautical at their meeting with CEACNA. 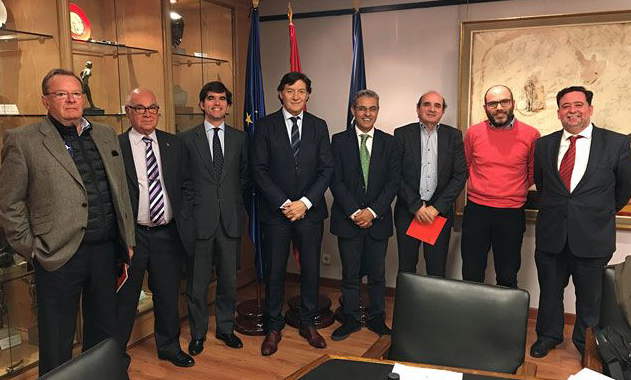 The news and the photo was taken form http://nauta360.expansion.com, excellent web dedicated to the world of nautical in Spain. Before we forget, the place and the distribution of the furniture and the protagonists does not seem the most appropriate. There are chairs by means of the photo (had to have retired) and they cover the official flags (no one should have stood in front). The first flag on the right, as it looks, should have been cast separately from the two officers, in addition (it is not an official one). But to what we were going. The question is: What do we do with our hands? Of course do not put them in the pocket (first left), nor put them behind as if you were to been shooted (second and third on the left, and first and second on the right). Putting them in front of each other and covering the ‘noble parts’ like football/soccer players on the barrier during a foul throw is not recommended (third, fourth and fifth on the right). The Jackets, moreover, had to take (second by the right) and to close as it is standing (badly that they carry it open). Close without being opened, which is also wrong (first on the right).